Relational Ministry On The Streets of Kensington: Searching for Mickey - Never Give Up! As I begin writing this blog, I'm not sure if Mickey is missing or laying low for some reason I don't know. I've spoken to several people who say they have seen her as late as this past Tuesday (and maybe Thursday - yesterday of this writing). It's hard to know what to think and do to find her or to give her whatever space she needs for whatever purpose she has. I just hope she's safe. The search for Mickey yesterday took a fascinating and wonderful path as I visited with Anna Batten (Yes, she is an outrageously distant relative.) of "Never Give Up - Heaven Can Wait" two areas I had not yet seen up close. (Click here for a wonderful Facebook hosted video.) One of the places we visited is nicknamed "Emerald City" because it's on Emerald Street under a long railroad bridge. A woman turning from me so I would not see her light her rock of Crack Cocaine. She was embarrassed by her behavior because she was doing what her body called her to do as is the case with any addiction. Her embarrassment was increased by what we had learned about each other during our chatting over the past few minutes when we realized that we were from neighboring communities in Delaware County. How does this relate to Mickey? 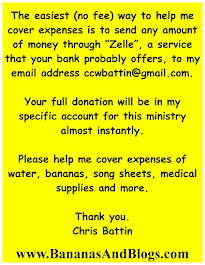 As I shared the flyer I created as seen above, with these men and women of varying ages and backgrounds, several expressed concern for this woman they know and care about and love. Some offered suggestions on where she might be and where she typically can be found. One mentioned a small apartment house where she sometimes visits friends. I had seen Mickey go in under a bridge near the Aramingo Ave. exit of I-95 on a tip the night before that Mickey may be there. No one was there at the time but these pictures show a bit of what we found. 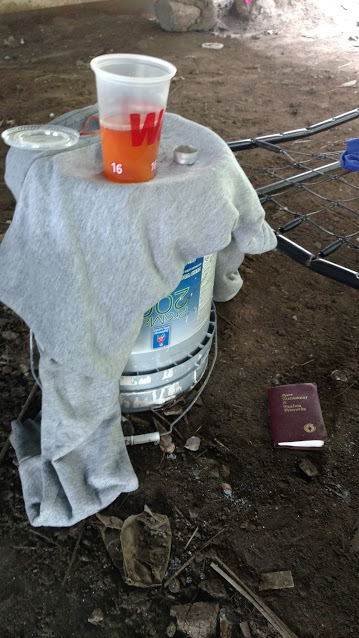 We left Gaitoraid, PB&J sandwiches, and Mickey's "Missing" flyers on each mattress. Well, as I said, we left here and made our way to the apartment house where Mickey has been known to visit a friend. Located next to a community vegetable garden, this residence is filled with people whose hopes and dreams for a better life seem to be all but gone. Our visit seemed to break up the monotony and give them something else to think about. 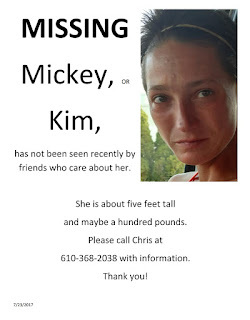 Each person knew Mickey and gladly took a flyer with the understanding that she was not in any trouble and that we care about and are concerned that we had not seen her. As much as I wanted to keep actively searching for Mickey, there was one more person who needed to meet Anna. 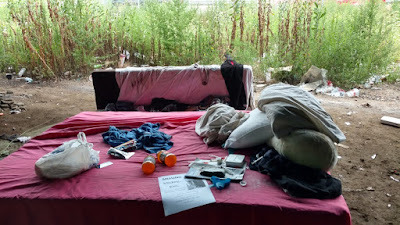 That was Mike who has been living behind the Rite Aid on Aramingo for about five weeks. They hit it off nicely as they compared their Italian childhoods. The conversation was mixed with the normal stuff of life and getting Mike's life unstuck from its current setting. Mike was sure to say that he had not seen Mickey in several days. In that one comment from Mike about Mickey, I was all the more aware that while she may be homeless and addicted, Mickey is still a very cared for human being, something of a feral kitten in her approach to others as I said before but a human being, made in the image of God, none the less. I just hope and continue to pray that one day soon we will see her safe and sound again. 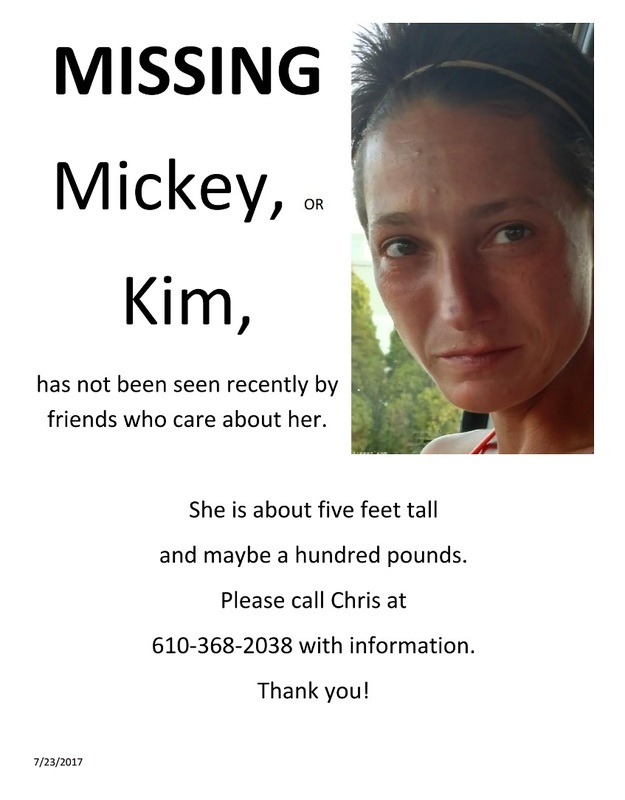 Please keep searching for Mickey. The picture at the top is a printable flyer. She is someone's daughter who needs to be found! Dad Would Be Proud of Urban Hope!